I love adding mushrooms to my rouladen gravy, so I included them here as well. Wunderbar! 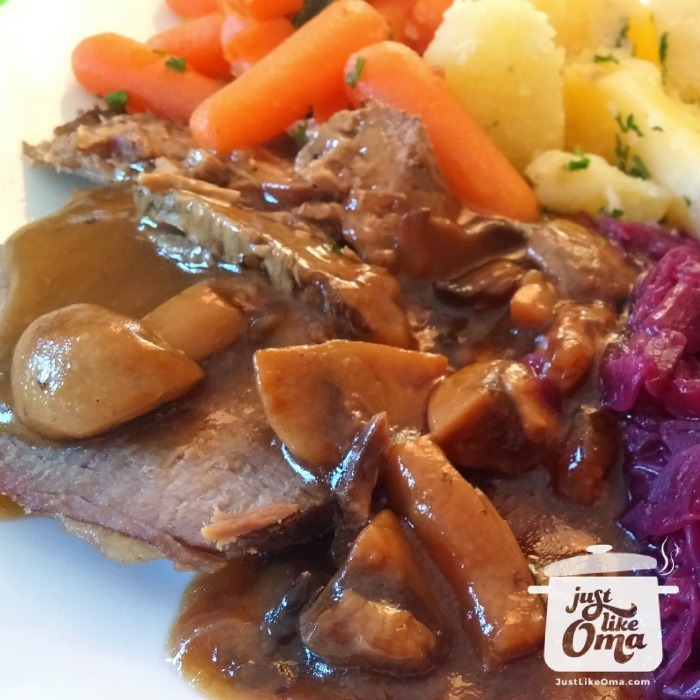 I created this slow cooker roast beef one day when I knew I was going to be too busy to make a special dinner for company. I wanted special. I wanted that wonderful taste of rouladen with its amazing gravy. But, I was going to be gone all day. Dare I take my expensive bottom round roast and pop it into the slow cooker without browning? I did and included the traditional rouladen ingredients. The result? It had all the flavor of the rouladen meat AND THE GRAVY and was so easy to put together in the morning. Mix together 1 Tbsp cornstarch with 2 Tbsp water and pour into slow cooker. 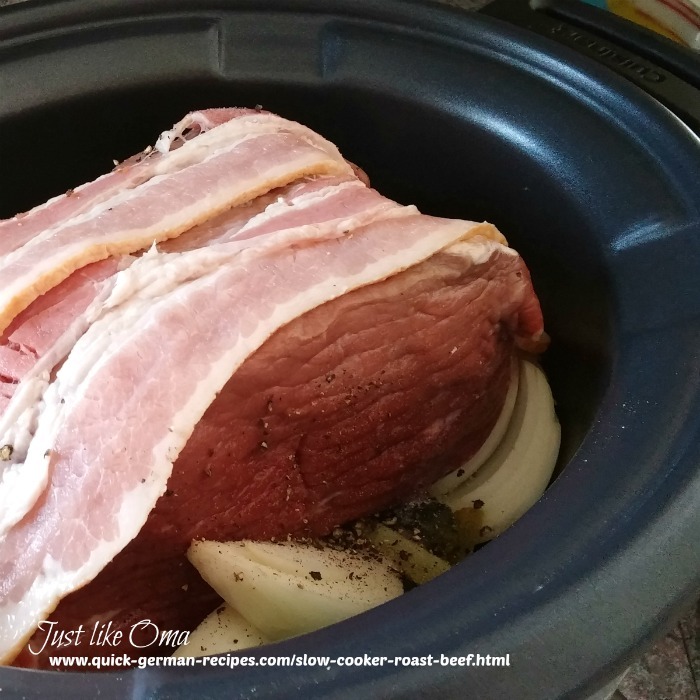 Add onion, dill pickles, and 2 slices of bacon to slow cooker and put roast on top with fat side down. Sprinkle with salt and pepper. Cover roast with remaining bacon slices. Remove meat and tent with foil to rest while you make the gravy. Strain cooking liquid through sieve into a saucepan and bring to simmer. To thicken gravy, combine 2 - 3 Tbsp cornstarch in a little cold water. Stir into cooking liquid until slightly thickened. Add whatever ingredients you normally use in your rouladen. If you don't like pickles, omit them. If you normally add carrots, etc., add them. If you normally use mustard, add a bit to taste. I love adding mushrooms to the gravy. Yum! YES, of course, you can brown the meat before putting it into the cooker. This will add a nicer 'look' to the finished roast and will increase the flavor. However, if you're in a real hurry in the morning and really don't have the time to brown the meat, just go ahead. The flavor will still be fantastic. This is my NEW go-to recipe when I need something easy and special. Everything into the slow cooker. Cover. On high for 6 hours. WUNDERBAR! Since rouladen were so expensive (and consuming to make), I created also created Beef Flatladen! Vary the type of meat. (Even pork works!) Vary the size of chunks (usually about a 2 - 3 inch square and about ¾ inch thick). Leftovers are delicious, so make lots! This recipe takes a bit more time, but, my - my ... is this delicious! Use almost any cut of meat. Slow simmering tenderizes the meat. Cut meat into size needed. Brown in small batches in butter. Add onion, bacon, dill pickle (the traditional rouladen flavors), seasonings, and water. Let the whole thing simmer for about 2 hours. 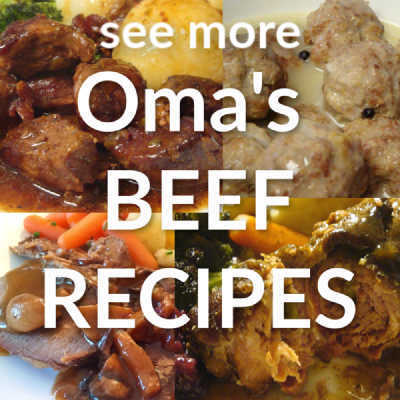 If you are looking for the traditional rouladen, check out my Rouladen recipe. SO WUNDERBAR! It's our 'special' dinner, usually together with potato dumplings and red cabbage. Doesn't get more German than that! "Pride leads to disgrace, but with humility comes wisdom."